So about a year ago I was on a camping trip with just a friend and I. We had the rear seat down and all our bags and gear piled in the back, While moving some gear around in the back one of the straps on a bag got hooked on the pull knob for the seat. without realizing it I snapped the latch pull clean off. Then the next day when we got home I did a really stupid thing and when done cleaning out the car I flipped the both seats up. So I just lived with only having one working seat for almost a year. 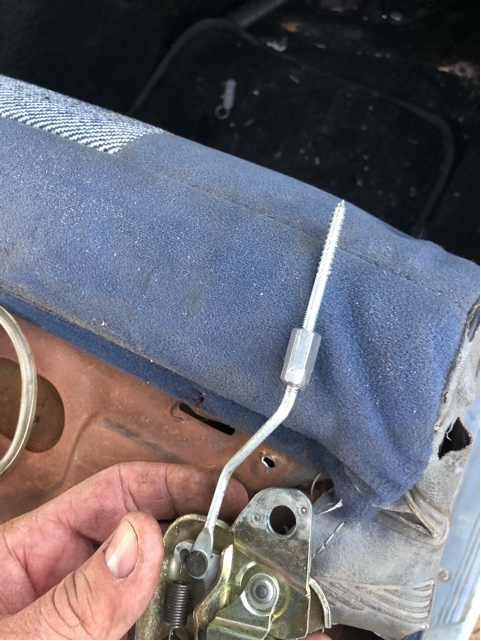 The other day I was at the junk yard and found a tercel wagon, so I pulled the latch from its back seat. I brought it home and then set on fixing my car. The first trick was to get the seat folded back down. 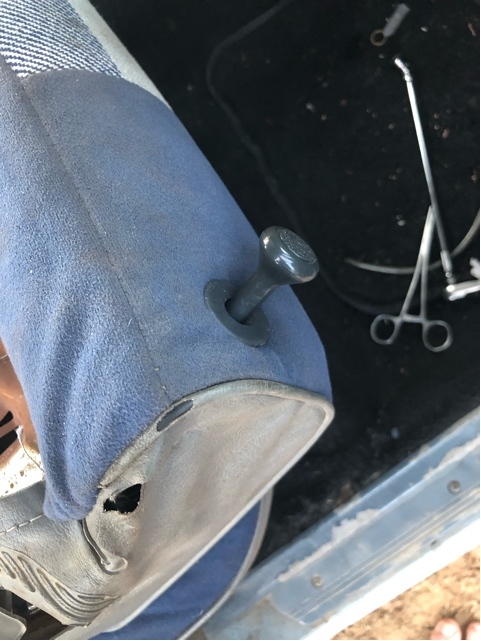 With some hemostats and a pen light I was able to look down the hole and find the broken rod an grab it and get the seat down. Then I removed the seat back cover. 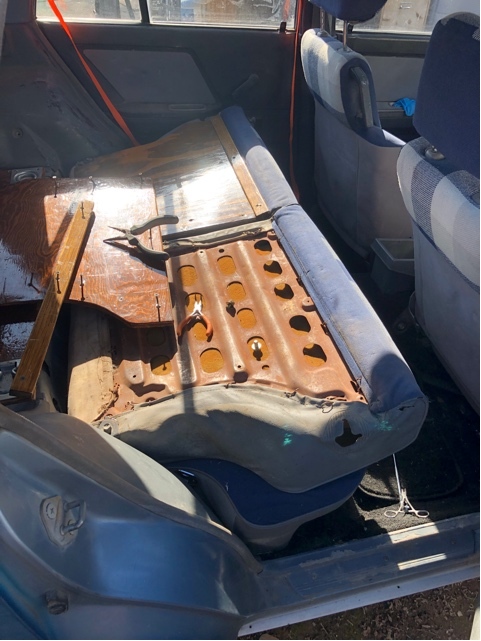 On the normal interior thats the 3 screws on the metal trip at the top of the seat and a few plastic rivets to the seat and the carpet some up. You can see my car I made a plywood piece for the back. with the seat back off I used 2 pair of needle-nose plyers to un hook the hog rings across the top of the seat and down the side. 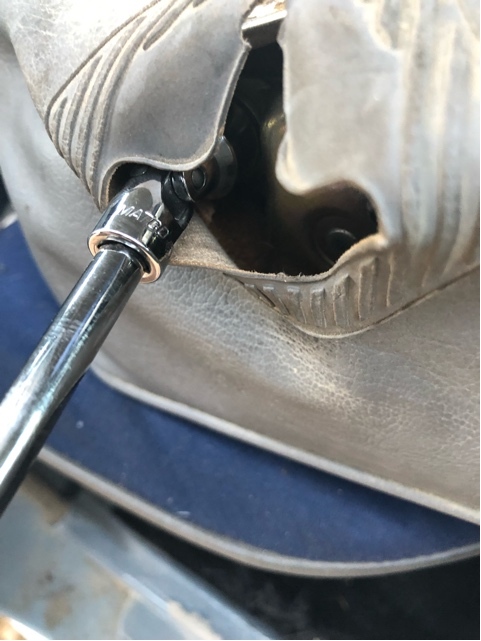 With the seat cover loose I was able to access the 2 12mm bolts holding the latch in place with a 1/4"dr swivel socket through the hole for the latch. After removing both bolts I snaked the latch out. 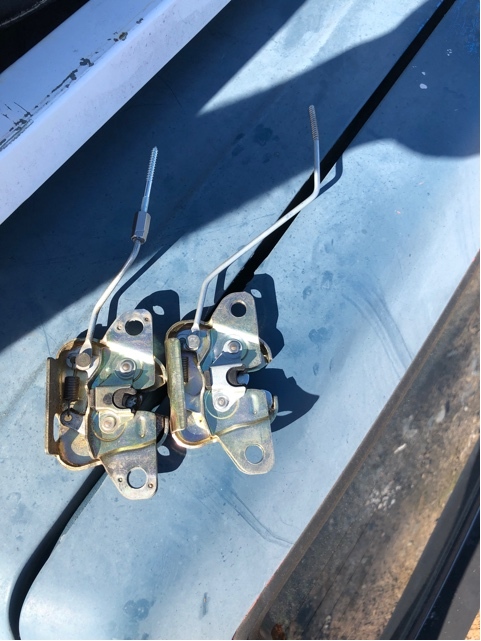 I went to install the new latch and I found the rod wasn't the same length as my existing latch, I mean it would have stuck out of the whole at the top a good 2 inches. I guess the car in the junk yard had higher backed seats of the latch in a lower positing. maybe it was a 2wd. So I had to get creative. I played with the old latch and I could get a #6-32 die to thread over the rod, but it didn't make very deep threads. I went to the hardware store to see what they had. I found a #6-32 coupler nut and a #6-32 by screw thread stud. I threaded the coupling nut to the latch but it was loose. So I mixed up some JB weld and then threaded the coupling nut on and for good measure I gave the nut a bit of a squeeze in the vise. I let the JB weld set up over night. This is what I came up with, here it is next to the latch from the junk yard. 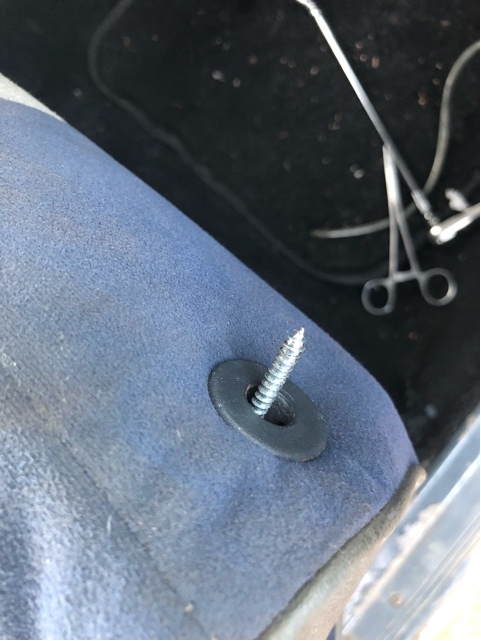 I fought getting the spiky screw through the seat. 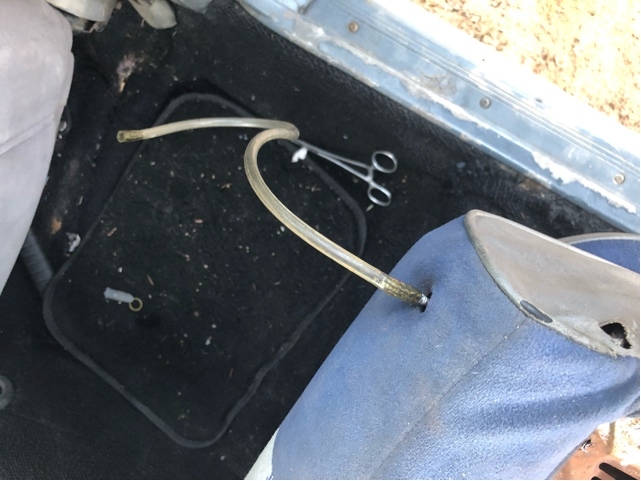 then I found some old 3/16" tubing and pushed it in from the top of the seat then screwed it on to the screw part and used it to guide it through the seat. 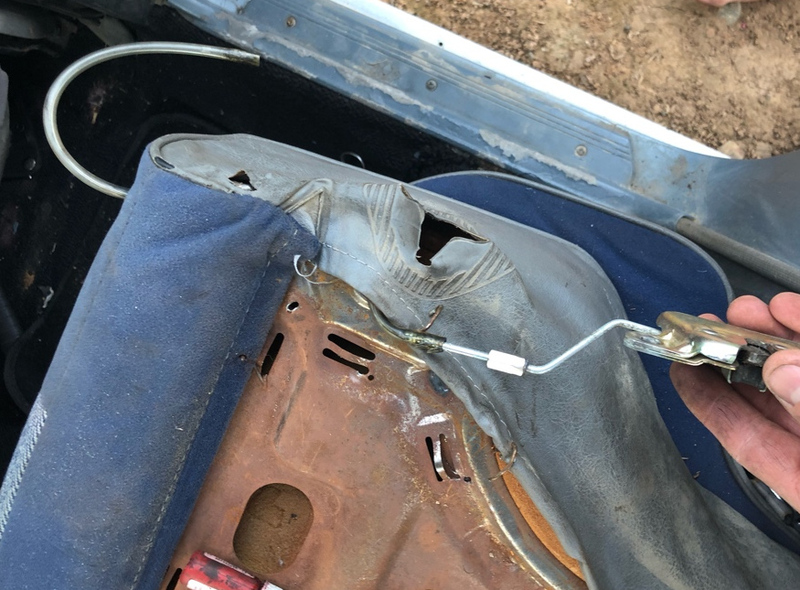 I used the swivel socket to get the bolts back in and then attach a new pull I got from the junk yard. I then used the plyers to put the hog rings back and reattach my seat back. Hope this helps and I hope it saves someone from waiting around to find a new latch. 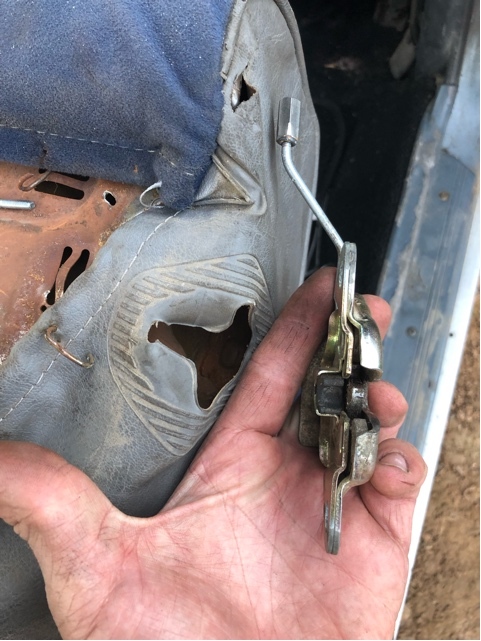 I wish I would have tried to fix my latch last year! My first car was a Tercel, and I'm still driving a Tercel, some people say I need an Intervention.